The Kanopus ST satellite is outfitted with a microwave radiometer and a multi-spectral imaging payload, officially dedicated to ocean and weather research and operational meteorology. Documentation shows that the conical scanning radiometer covers a ground swath of 2,200 Kilometers and reaches a resolution of 12 to 160 Kilometers while the imaging system covers a 1,000-Kilometer wide area at a resolution of 30 to 50 meters. Comments made by Russian Military Officials in 2010 indicated that the Kanopus ST satellite would be capable of scanning the underwater areas for submarines, however, the published specifications would not permit such a detection. 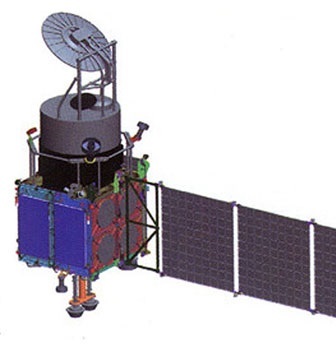 Nevertheless, after these comments were made, all information on the Kanopus ST satellite and its preparation for launch was restricted, indicating a military-directed mission. 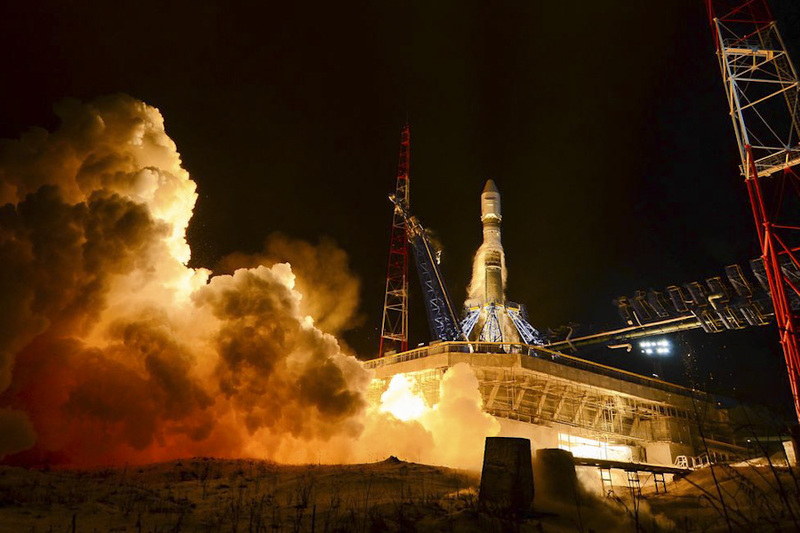 Kanopus ST lifted off atop a Soyuz 2-1v rocket on Saturday at 14:09 UTC, departing from a snowy Plesetsk Cosmodrome under the loud thunder of its NK-33 main engine and RD-0110R steering engine. There had been some doubts associated with the continued use of the aged NK-33 engine given its spotty track record with multiple test stand failures in recent years and of course last year’s Antares launch failure that had been traced back to a material defect introduced when the engine was manufactured over 40 years ago. Outfitted with new ignition and combustion chambers, the NK-33 delivered a flawless performance, boosting the 44-meter tall Soyuz 2-1v rocket out of the atmosphere on its north-westerly trajectory, heading for a polar orbit. Separating from the rocket two minutes into the flight, the first stage handed off to the second stage that fired its engine for four and a half minutes, reaching an orbit of 208 by 681 Kilometers. Assuming control of the flight, the Volga upper stage conducted a pair of burns to deliver the stack to a 685 by 695-Kilometer orbit. Less than two hours after launch, the Volga upper stage commanded its two payloads to separate. The small 16-Kilogram КЮА 1 radar calibration sphere separated from the cylindrical payload adapter without issue. Kanopus ST however, failed to separate when one of its four pyrotechnic separation devices could not be initiated. Still attached to the Volga stage, Kanopus began transmitting and teams on the ground mistook the arriving signals for confirmation of a good separation. It took until Sunday for information to come forward that Kanopus ST had remained attached to the upper stage and orbital data confirmed the separation failure, as only two objects were detected in the expected Sun Synchronous Orbit. According to press reports, teams repeatedly attempted to command the release of the satellite, but without luck. As a corrective measure, Volga was commanded to perform a deorbit burn in the early hours UTC on Sunday. Due to the additional mass attached to the stage in the form of the Kanopus satellite, Volga did not have enough propellant reserves for a complete deorbit maneuver. 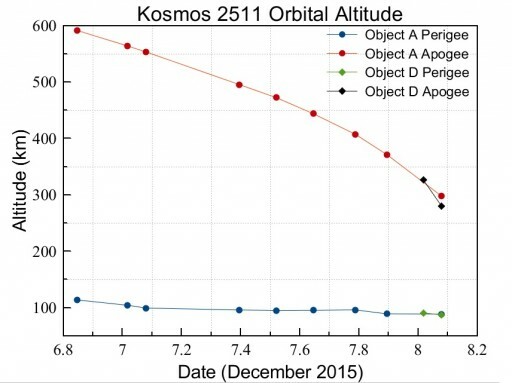 After the burn, the object, preliminarily designated Kosmos 2511, was found in an extremely-short lived orbit of 113 by 591 Kilometers with a life expectancy of around two days. Skimming the upper reaches of Earth’s atmosphere when passing the perigee of the orbit, the spacecraft rapidly lost apogee altitude and the orbit got more and more circular. On Monday, some time prior to 18:23 UTC, an object got liberated from the Kanopus ST / Volga stack and was tracked as 2015-071D. Only two sets of orbital data were issued for this object, making an analysis of its potential identity difficult. The two elsets seemed to indicate a higher rate of descent of the separated object, suggesting an area to mass ratio larger than that of the original parent Object A, pointing to a light component that separated from the stack as the result of aerodynamic forces acting on the vehicle when skimming the atmosphere. It is possible that the Kanopus ST satellite separated from Volga in its entirety, if the final lock holding the satellite somehow gave away. Observers of the Kosmos 2511 situation from France reported seeing the smaller Object D in an orbit passing ahead of the larger and brighter Object A. This further supports that 071D was a smaller item that quickly lost altitude, but the possibility of it being Kanopus can not be ruled out. Additionally, observers noted that the parent object was steady in brightness, indicating the complex had entered an aerodynamically stable attitude. 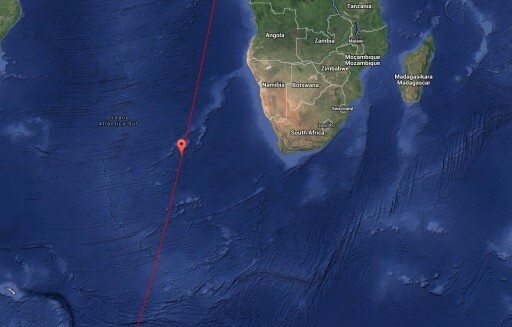 The observations were made around 17:10 UTC, confirming Object D had separated some time before that. Object D re-entered the atmosphere at 4:37 UTC +/-31 minutes, according to data from USSTRATCOM, putting the location of orbital decay over a long stretch from North Western Africa, the Atlantic Ocean, Antarctica and into the north Pacific. Only the opening edge of the window is located over inhabited land masses. 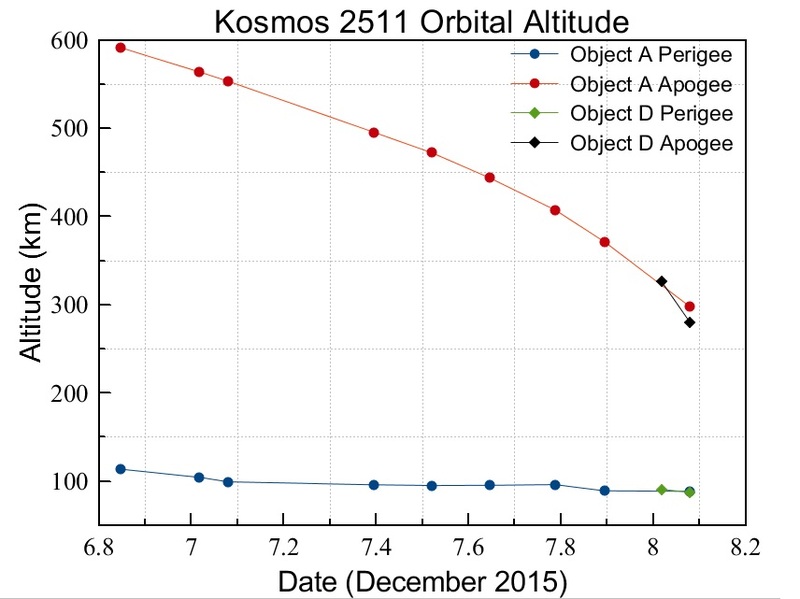 The large window of uncertainty associated with the re-entry of 071D further supports it being a smaller object. 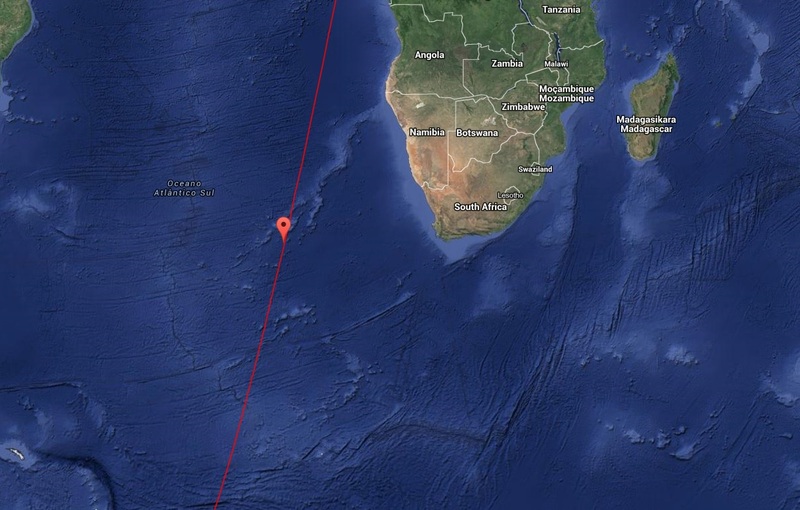 Object A, presumably the Kanopus ST / Volga stack, re-entered at 5:43 UTC +/-1 Minute at a position of 359°E 35°S over the Atlantic Ocean. The decay data represents the 80-Kilometer passage of the spacecraft, not the impact location. The two-minute window of uncertainty corresponds to a ground track length of around 900 Kilometers along which orbital decay took place, still placing the decay location and impact of any surviving debris in the Atlantic, away from any major land masses. The Entry Point, defined by USSTRATCOM at an altitude of 80 Kilometers, marks the beginning of of the disintegration of the spacecraft (+/-10km) due to drag building up to a destructive force, triggering the onset of fragmentation of the spacecraft structure. The solar array and radiometer dish were first to be ripped off before protruding components such as antennas, star trackers and instruments were separated from the main body which suffered a structural failure later on, falling apart with its individual components largely being destroyed in the entry process. The shock wave layer forming just in front of the spacecraft and any separated components leads to considerable heating that causes the incineration of the majority of the spacecraft structure. The mechanical deceleration experienced during re-entry can be up to 20Gs further crushing the structural components and causing the break-up of the spacecraft. 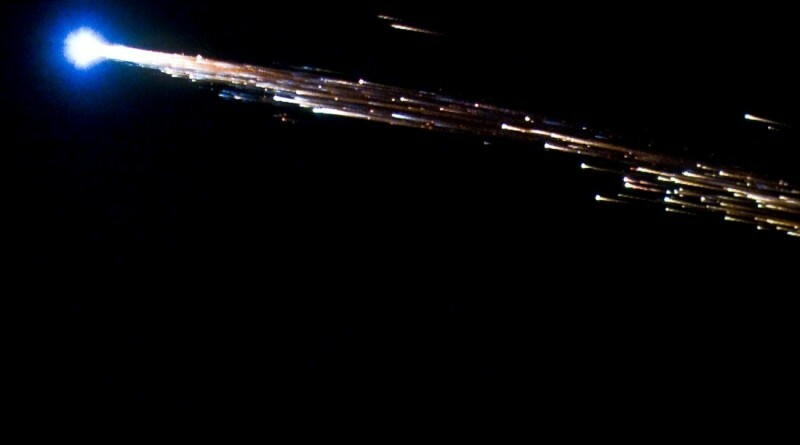 Temperatures reached during re-entry can melt most metal types used on the spacecraft and most of the fragments created on entry fully burn up, leaving a cloud of dust in the upper atmosphere. However, it is known that about 20 to 40% of a re-entering satellite’s total mass reach Earth’s surface. It has to be considered that the spacecraft and any surviving components travel at a high horizontal velocity when dropping out of orbit, despite being rapidly slowed down in the atmosphere. The arc each surviving component travels depends on its area to mass ratio. Additionally, the dispersion of debris is strongly dependent on cross winds that can cause a cross-track spread in debris. 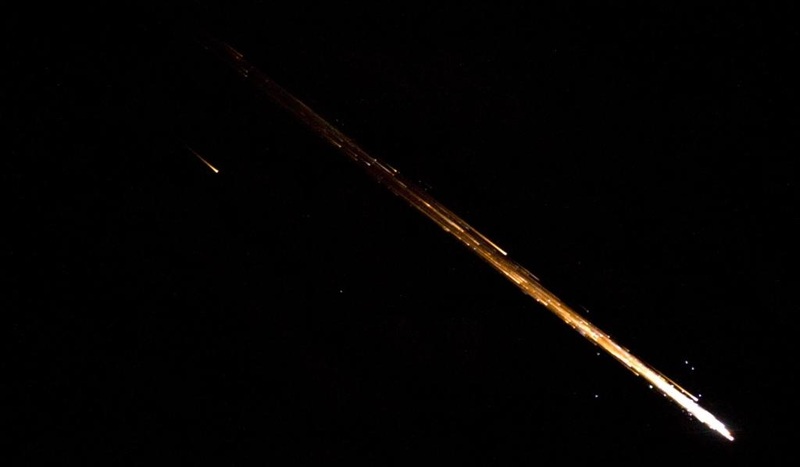 Typically, the debris field of a re-entering satellite stretches from 500 Kilometers downrange from the Entry Point up to a distance of 1,300 Kilometers, where the most dense components come down. For the Kanopus ST satellite and Volga Upper Stage, with a combined mass in excess of one metric ton, a number of components were likely to survive re-entry – in particular small spherical pressurant and propellant tanks of the upper stage as well as components of the main engine. Also likely to survive were the three reaction wheels of the spacecraft which represent dense metal disks that can easily withstand the re-entry environment. Some bus structure components may also have survived.